On 25 April 2016, France will launch an architectural competition in New Zealand which will see the winning team commissioned to design the French memorial to be inaugurated at Pukeahu National War Memorial Park by November 2018. The global budget of this initiative amounts to over 800,000 New Zealand dollars. A dedicated website was launched today to provide information to participants and interested members of the public www.frenchmemorialatpukeahu.org. On the occasion of the one hundredth anniversary of World War I, and at the invitation of the New Zealand authorities, a French memorial will be inaugurated within the Pukeahu National War Memorial Park in Wellington in 2018. Pukeahu is administered by the Ministry for Culture and Heritage on behalf of the New Zealand Government. The design of the memorial, a gift from France to New Zealand and its people, will prioritise creative dialogue between the two countries. This arises from the strong belief that a memorial representing the relation between the two nations should have its main characteristics and purpose designed collectively, through a collaboration uniting French and New Zealand representatives from civil society. 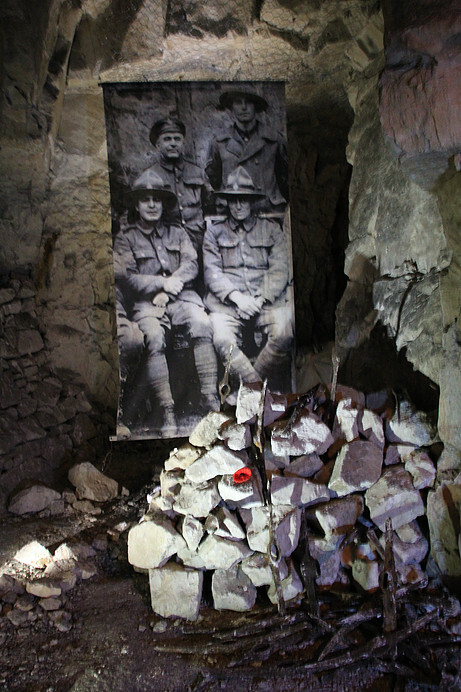 In that regard, and in order to reflect upon the general context and spirit under which this memorial should be designed, a France/New Zealand symposium took place in France from 6 to 12 December 2015. Its purpose was to establish the creative brief of the memorial, in regards to aesthetics, design and remembrance purpose. It included the following New Zealanders: Lt-Gen. Rhys Jones, playwright and newspaper columnist Dave Armstrong, architect Stephen McDougall, writer Elizabeth Knox, film producer Robin Laing and Māori military historian Dr. Monty Soutar. The work of this symposium was itself based on the material gathered through a series of interviews with more than 30 New Zealand personalities (artists, historians, designers, writers, and prominent New Zealanders involved in the commemorations of the Great War). Photo of Carrière Wellington by Stephen McDougall ; image courtesy of the New Zealand Embassy in France. “France places great value on the significance of this memorial to celebrate the relationship between our two countries, the enduring friendship that unites us and the common memories we share, of which the First World War was a major example.”, explained H.E. Mrs Florence Jeanblanc-Risler, Ambassador of France to New Zealand. Following these first steps, the French authorities decided to organise a public architectural competition in New Zealand with a jury composed of five French and New Zealand personalities: HE Mrs. Florence Jeanblanc-Risler, Ambassador of France to New Zealand, acting as co-chair; Mr. Stuart Gardyne, Director of Architecture+ Studio and NZIA 2015 Gold Medal, acting as co-chair; Mrs. Myriam Achari, Director for Remembrance, Archives, Military Heritage, French Ministry of Defence; Mr. Yves Le Maner, History Professor, Member of the French First World War Commission’s Scientific Committee; Ms. Sarah Dennis, Former New Zealand Ambassador to France, board member of the France/New-Zealand Friendship Fund. The competition brief will be released on 25 April 2016 on www.frenchmemorialatpukeahu.org. The winner will be announced on 11 November 2016. The competition is endorsed by the New Zealand Institute of Architects and will take place in close collaboration with the Ministry for Culture and Heritage and the Wellington City Council. The French Embassy in New Zealand is extremely grateful to these partners for their support and guidance, as well as to Rider-Levett-Bucknall Inc. for generously sponsoring the competition by offering free-of-charge quantity surveying. Stage One will be at a concept design level. This step is an open competition to any team, local or international, involving at least one New Zealand registered architect, and/or practices, academics and/or graduates who are members of the New Zealand Institute of Architects. Stage Two will be limited to a maximum of 3 entries selected from Stage One to submit a full proposal. A living monument, acknowledging the shared history and the shared interests that guide the two countries’ mutual future. The inclusion of a strong French component into the memorial, either through the collaboration with a French creative professional or organisation in the design, or through elements symbolic of France or coming from France (objects, plants, memorabilia). The list of main criteria and guidelines is available on the website. Follow progress and get involved through the hashtag #FRMemorialNZ. Public announcement of design competition winner.